In 2017 we presented three plays in three different venues – quite an achievement! The Spring production of Alfie was the last to take place at the Commemoration Hall before its closure for major refurbishment works and also went on to represent the Club (in an abridged version) at the Cambridge Drama Festival. Probably best known from its big screen incarnation starring Michael Caine, Bill Naughton’s play premiered in 1963 and pictured a London still in an austere post-war hangover and yet to explode into the vibrant, swinging 60s. Alfie became our biggest selling show on record (beating previous record holder Outside Edge by one ticket!) & drew high praise for an ‘energetic & entertaining production’ from the Festival adjudicator. The cast & crew worked incredibly hard on this production to make the many transitions between scenes & locations as seamless as possible, giving the production a slick & pacy edge – a genuine team effort. Combined with an evocative soundtrack & period wardrobe Alfie was a tragi-comic affair for our audience with a central character you either love to hate, or hate to love. Finding an alternative venue for our following two productions was a big project for the committee. We felt it was essential to stay in Huntingdon, preferably not too far away from the Commemoration Hall so as not to inconvenience our audience too much. We also wanted to keep our excellent front of house experience in place so facilities for a bar were also a must. The Town Hall offered two spaces which lent themselves to different styles of theatre, it was close by and the dates we wanted were available. The Town Hall it was. The Assembly Room on the top floor of the building would be our venue for Shakers, the comedy by John Godber (Bouncers, Up N Under) & Jane Thornton. Vicky Spurway made her debut in the director’s chair and assembled a talented cast, half of whom were brand new members. The four actresses faced the challenge of playing multiple roles, switching instantly between the many & varied customers as well as the long-suffering waitresses of Shakers cocktail bar. The cast & crew pulled it off superbly – drawing an excellent review from our NODA rep Julie Armstrong who commented “I left the performance with a smile on my face and the 1980’s soundtrack ringing in my ears. Shakers was a fabulously fun piece of theatre!” Thanks to a grant from the Freemen’s Trust of Huntingdon we were able to light the show with a brand new portable lighting kit which has enabled us to perform in ‘non-theatre’ settings. As soon as we reached the decision to present Arthur Miller’s The Crucible in the Town Hall’s historic Court Room for our Autumn play, we strongly suspected that we would have a commercial & critical success on our hands. And so it proved, as all five performances went on to sell out long before opening night. Under Rae Goodwin’s meticulous direction & with an exceptionally strong cast & crew on board (many making their debuts for the club), this production felt like the culmination of a lot of hard work over the last 3 or 4 years. It was bold, daring & powerful, presented within the intimate confines of a venue where the audience were just inches from the action. A glowing NODA review ended “with a wonderful and atmospheric setting, inspired use of music, great direction and an excellent cast, HDC’s The Crucible was a triumph!” Indeed, The Crucible has been nominated for Best Play at next May’s NODA district awards. As well as all the on-stage activity there was a busy social calendar in 2017, including theatre trips to see new plays – Fracked at the Cambridge Arts and Limehouse at the Donmar Warehouse in London, where we also took part in an open workshop on the rehearsal process. We enjoyed a fabulous acting workshop with actor David Hall, where we covered aspects of movement & voice & learned a great deal. The Crucible director Rae Goodwin attended the RSC’s Big Backstage Weekend to go behind the scenes at the Royal Shakespeare Theatre in Stratford Upon Avon & learn some tricks of the trade that we can feed into our productions. 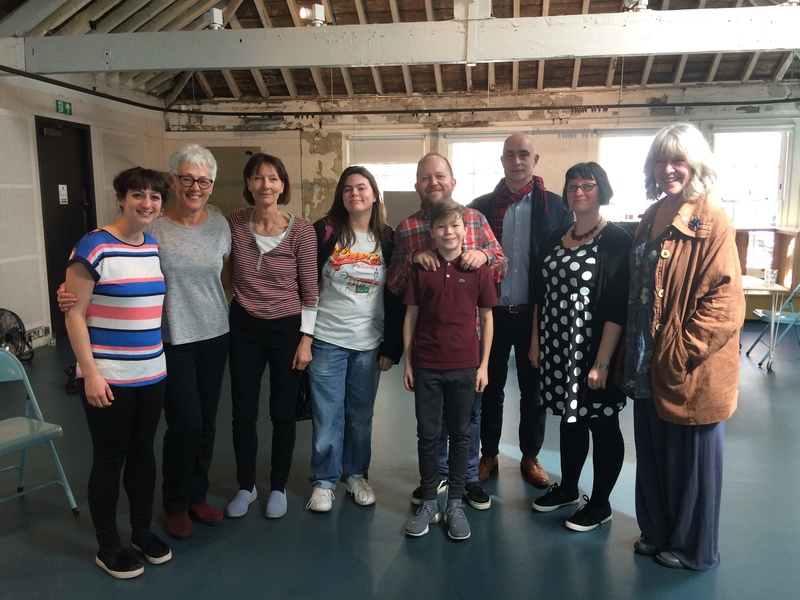 I also attended a workshop on directing hosted by Theatre 503 Artistic Director Lisa Spirling – an opportunity to learn from a professional director, which was invaluable – lots of techniques & ideas that will find their way into our rehearsal room. And of course to cap it all off there was our fantastic Christmas Party in December. A great opportunity to let our hair down after a challenging & ultimately rewarding & satisfying year. Here’s to 2018!